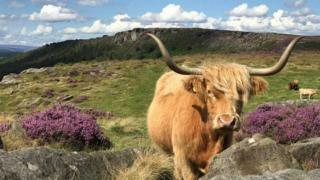 A herd of cattle has been forced from a Peak District beauty spot it had grazed on for 40 years after a complaint. The 30-strong highland herd had roamed Baslow Edge for decades alongside a popular footpath. Last year the cows, which had young calves, confronted a dog. When the owner complained, farmer Alex Birch was told by authorities to move his herd. Mr Birch said the issue caused "heartache" and he has had to sell or slaughter his animals. Mr Birch, 32, runs the family farm with his granddad David Thorp, who first introduced highland cattle to the 300-acre site. He admitted the cows "had a go" at the dog, which was on a lead, but said no-one was injured. "All cows are dangerous when they have a young calf, but that's nature. A dog is the same as a wolf, the same as a predator, it's just protecting its young," he said. After the dog's owner complained, the Health and Safety Executive (HSE) said the cows represented a threat and had to be moved. Mr Birch said: "As there's nowhere else for them to go, they had to get rid of them. "The pregnant ones were sold off, the ones which weren't will be killed. "There was no real financial incentive to have them, but they were part of the farm, part of the routes of Baslow and they were picturesque. "My granddad is deeply, deeply upset. This isn't about the money, it's about the heartache." Mr Birch admitted there had occasionally been problems before but they had always been dealt with privately. He said: "It's a dog and its owner, who was just visiting for the day, who have forced these cows to move from what was their home. "I am concerned it sets a precedent for the HSE to order livestock around on the say-so of a tiny minority." Social media posts have brought dozens of messages of support and sympathy and an online petition calling for the herd to return has got nearly 8,000 signatures. Award-winning Peak District photographer Villager Jim has also started a campaign to get the decision reversed. The HSE said cows could be kept on the land only if they did not have calves. "We have investigated concerns raised in relation to cattle at Baslow. "We have worked with the owner of the cattle and the matter has been satisfactorily resolved," a spokesman said.